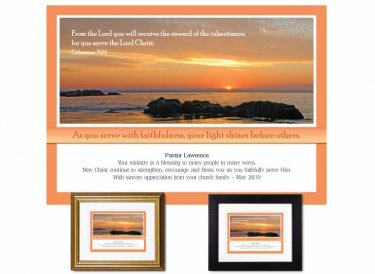 This unique memento is a wonderful way to convey thanks to your pastor, priest, youth minister - anyone in the ministry whom you'd like to acknowledge. "As you serve with faithfulness, your light shines before others." It features this excerpt from Scripture: From the Lord you will receive the reward of the inheritance; for you serve the Lord Christ. There is ample space to personalize it with your message for the recipient.